← The Sit Back And Wait Syndrome..
At your suggestion, I just read an article on the Red Letter Christian website about how the Nashville Statement (which I had never heard of) was wrong and took Jesus’s teachings out of the statement and basically how unkind it was. I agreed. Then I read the comments and low and behold, they confirmed what I’ve been feeling all along and have said here many times. We are in the midst of a far right fundamentalist evangelical takeover that has nothing to do with Jesus’s original teachings, but their lust for power in instilling fear and hate and judgement. As I recall, one of Jesus’s biggest statements was about NOT judging. And these mega churches and this prosperity theology…please! What would Jesus think of that? It’s a disgrace especially since they make millions by sucking in the people. And yes as you said, the Red Letter Christians may speak up against this present hateful dogma, but it’s just a website with probably little following. I meant in a previous comment, where are the everyday churches in communities, in their stance against this kind of hateful pattern and thinking? I do not hear them speaking up. I am so discouraged by the meanest of people and if God exists (God help us). Otherwise we’re screwed. And this is what fits your above quote perfectly and is so true. 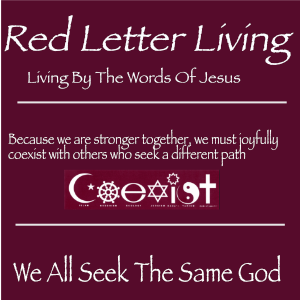 RedLetterChristians is not just a small website. They have in excess of 50,000 followers and Shane Claiborne who is one of the founders is probably the number one selling theologian author. All of his books end up on the NY Times best seller list. He is himself a pastor doing it like Jesus did. Jim Wallis is another founder who is a noted theologian and was the spiritual advisor to President Obama. He is often cited by CNN and others as a religious scholar and graduated from Harvard. They have hundreds of congregations linked to their cause. Mary, you need to accept that you are not the only one railing against the evangelical fringe. There are probably millions of us out there. Together we can make a difference and turn this around.